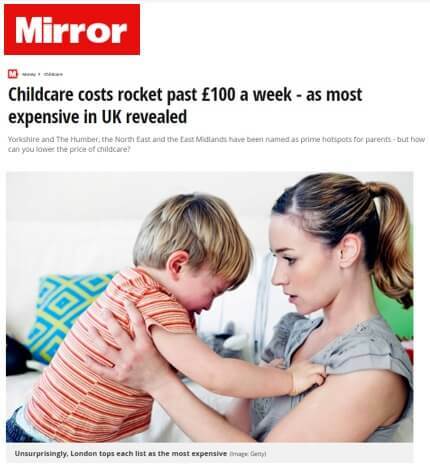 For the UK’s leading platform of childcare providers, Childcare.co.uk, we recently created the ‘The UK’s Childcare Costs’ story that delivered fantastic PR campaign results. We work with Childcare.co.uk, which is the UK’s leading platform of childcare providers, and handle its PR on an ongoing basis. One of the key activities we deliver for this client is creative, digital PR. This is where we aim to get a good spread of links from sites with a high Domain Authority (DA) to help improve the site’s SEO. In early 2017 we created a story with our client that looked at its internal data to reveal the average hourly rates for childcare across the UK, split by region. 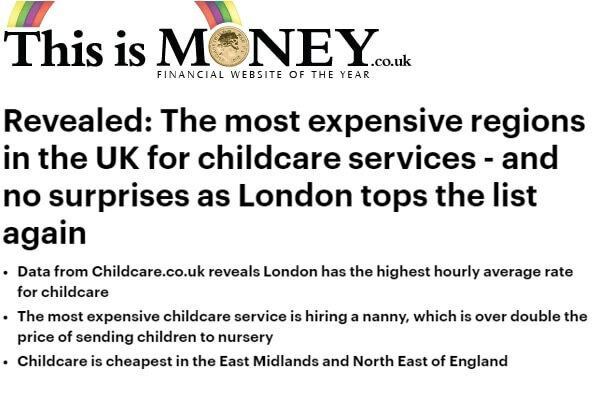 The average costs story was enhanced by the creation of an online calculator on the Childcare.co.uk website, where parents or carers can enter their postcode to find average cost for nannies, childminders, babysitters and nurseries in their area. Given consumer media outlets are keen to know changes in costs and personal finance stories are often popular, we decided to re-run this story in 2018 and then in 2019. In our experience, we know it’s worthwhile re-running some client data stories to see if there have been trends or changes compared to other time periods! The story for 2019 was a great success, as it had been previous years, and achieved some fantastic PR campaign results. 124 pieces of coverage naming the client in the story including titles such as This is Money, iNews and The Mirror. Coverage linking to the client’s site, including The Mirror (DA 92), This is Money (DA 82) and Money Magpie (DA 50). Want to know how we could deliver great PR campaign results for your company? We’d love to chat – so please get in touch with us!